Creative chaos: madness or inspiration? I found the uncontrollable, indescribable madness of James Thierrée’s Compagnie du Hanneton absolutely, bafflingly inspiring. I couldn’t put my finger on why chaos would make me want to create, but perhaps Thierrée’s ability to acknowledge the chaos, to let it flourish without reigning in the madness and put that on stage with some semblance of distinct character and a coherent plot. Quite unlike anything else I’ve seen – dance, theatre or otherwise – Thierrée’s Tabac Rouge re-engaged my brain and set the urge to create pumping through my veins. 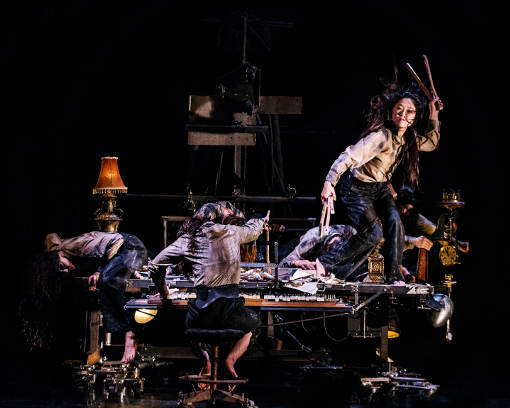 James Thierrée’s Compagnie du Hanneton contort, slither and glide amongst a unique steampunk set, developing a strange array of transient characters in Tabac Rouge at Sadler’s Wells this week. With the set design integral to the ambiance of the piece, we follow Thierrée as the protgonist through a dark world of imprisonment, swinging between despair and creation, comedy and anger. Thierrée’s Tabac Rouge is propelled by an overwhelming madness – self-destructiveness verging on creativity – that plunges its protagonist into bouts of inertiatic despair. He is constrained by his own creations – those being both the dynamic steampunk-esque set and the supporting characters surrounding him, whom he has either dug out from some pile of animal rubble or built from scratch – perhaps somewhere in between. Click on the link in the title to read my full review on Bachtrack. Previous PostCan you only write about what you know?Next PostCircus: Dance or not?